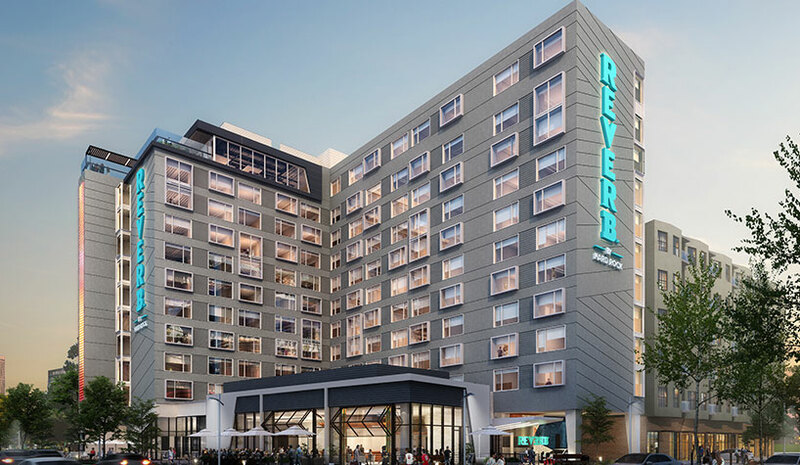 HOLLYWOOD, FL—Reverb by Hard Rock, Hard Rock International’s entrance into the select-service hotel category, will debut in Atlanta in February 2020 with its first property adjacent to the Mercedes-Benz Stadium. The new property will be developed and managed in tandem with Atlanta-based companies Bolton Atlanta LP and Hotel Equities (HE). Located in the growing neighborhood of Castleberry Hills, in downtown Atlanta, the upcoming hotel will have nearly 200 rooms featuring contemporary accommodations, amenities and public spaces designed for tuning in to what’s going on. All standard King & Double Queen rooms will feature stylish and comfortable furnishings, state of the art technology, fan-inspired artwork and signature showers. Travelers can also experience the Roadie Room, which includes six queen bunk beds and plenty of space for everyone. The communal spaces will include the Constant Grind Coffee and Bar, which serves guests’ favorite French press or pour over in the morning and a curated selection of wines and spirits at night. Guests will also be able to check out the panoramic views from the hotel’s rooftop bar; experience live musical performances; share ideas in the large co-working space, MEET; and get pumped at the multifunctional workout space. Previous ArticleAre You Delivering the Cleanliness Guests Expect?